FNB-80Li : 7.4 volt 1600mAh Lithium Ion rechargeable battery pack. It fits Yaesu VX-5R, VX-5Rs, VX-6R, VX-7R, VX-7Rb, FTA-720; Vertex-Standard VXA-700 (SPIRIT), VXA-710, Yaesu FTA-720, Standard-Horizon radios (HX-471, HX-471S), and others. Includes rubber gasket for water repellency. This battery provides high-watt operating capability and long life. It can be re-charged thru the radio with a Wall Charger (NC-72B, PA-48A) or DC Power Cord (E-DC-5BA), or in a desktop charger (CD-15A, EMS-58-80). 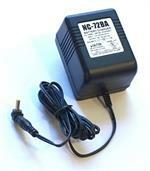 E-DC-5BA : DC Power & Charge cord - for Yaesu & Vertex radios. E-DC-5BA : DC Power & Charge cord for Yaesu & Vertex radios such as VX-8R, FT-1DR, VXA-700, VX-7R/Rb, VX-6/R, VX-5/R/Rs, VXA-100, VX-120, VX-150, VX-177, FT-250, FT-817, FT-530, VXA-300, VXA-700, and many more ! CBE-80 : Battery Eliminator for Vertex-Standard & Yaesu VX-5R, VX-6R, VX-7R, VXA-700, VXA-710, Standard Horizon, etc. 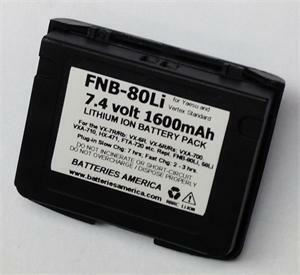 The CBE-80 is a Battery Eliminator for Vertex-Standard/Yaesu radios such as VX-7R/Rb, VX-6R, VX-5R/Rs; VXA-700, VXA-710 ("Spirit"), and STANDARD HORIZON HX-471 VHF & HX-471S TRI-BAND. One end plugs in DC socket; has coiled cord; other end clips on radio. FBA-23: Alkaline Battery Case for Yaesu, Vertex, and Standard-Horizon radios. Fits the VX-5R/Rs, VX-6R, VX-7R/Rb, VXA-700, VXA-710, etc. Special internal circuit converts 3VDC from cells to 4.5VDC to power the radio. 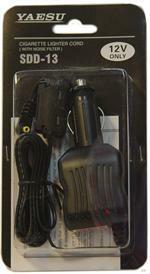 SDD-13 (was E-DC-5B): Yaesu-brand DC Power & Charge cord. Plugs into 12-13.8VDC socket; other end plugs into radio. Fits a WIDE variety of Yaesu & Vertex HTs (see x-ref list below).